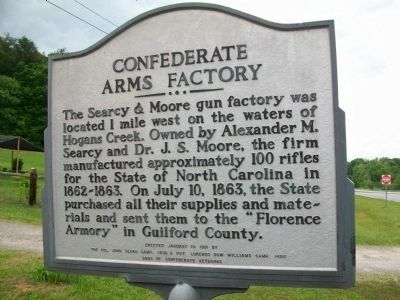 The Searcy & Moore gun factory was located 1 mile west on the waters of Hogans Creek. Owned by Alexander M. Searcy and Dr. J. S. Moore, the firm manufactured approximately 100 rifles for the State of North Carolina in 1862-1863. 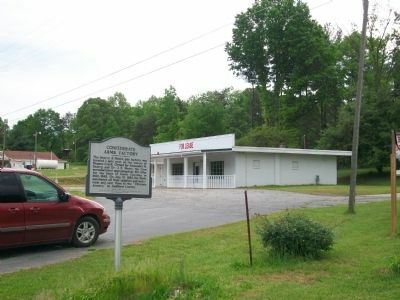 On July 10, 1863, the State purchased all their supplies and materials and sent them to the "Florence Armory" in Guilford County. Erected 1991 by The Col. John Sloan Camp, 1290 & Pvt. Lorenzo Dow Williams Camp, 1456 Sons of Confederate Veterans. Location. 36° 21.629′ N, 79° 56.735′ W. Marker is near Madison, North Carolina, in Rockingham County. 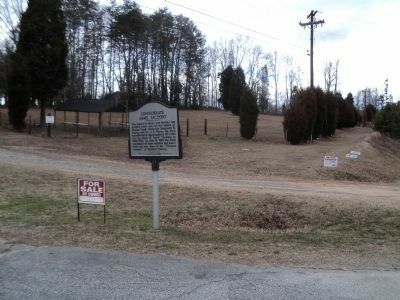 Marker is on Thomas A. Burton Highway (U.S. 220), on the right when traveling south. Touch for map. Marker is at or near this postal address: 4174 Thomas A. Burton Highway, Madison NC 27025, United States of America. Touch for directions. Other nearby markers. At least 8 other markers are within 10 miles of this marker, measured as the crow flies. Slink Shoal Sluice (approx. 1.4 miles away); Law Office of Alfred Moore Scales (approx. 1.9 miles away); Scales Law Office (approx. 1.9 miles away); Alexander Martin (approx. 3.2 miles away); Stephen A. Douglas (approx. 5.2 miles away); Upper Saura Town (approx. 8.7 miles away); Wentworth Methodist Church (approx. 9.8 miles away); a different marker also named Wentworth Methodist Church (approx. 9.8 miles away). Touch for a list and map of all markers in Madison. More. Search the internet for Confederate Arms Factory. Credits. This page was last revised on June 16, 2016. This page originally submitted on May 11, 2009, by Kathy Walker of Stafford, Virginia. This page has been viewed 1,500 times since then and 17 times this year. Photos: 1, 2. submitted on May 11, 2009, by Kathy Walker of Stafford, Virginia. 3. submitted on February 3, 2013, by Bill Coughlin of North Arlington, New Jersey. • Craig Swain was the editor who published this page.